Sneaky here with another pawsome interview of a pet character. Today, it’s my pleasure to cat chat with a fellow cozy mystery cat whose current book, Cat Cafe, is on tour with Great Escapes Virtual Book Tours. Oh, wow! It’s you— It’s really you! (Jumping up and down in kittenish glee) Sneaky, you’re my hero! I’m having a cat fit just to be in your presence. Okay, it’s not just because I’m young, only a little over a year— it’s because, guess what? I’m a Siamese too! Siameeeeese! Just like you! Oh, but you wanted to know my name. I’m Mab, a purebred lilac point Siamese that my cohabitor character Lynley Cannon rescued from a nefarious breeder when I was just a baby kitten. And oh yeah, my author’s name is Mollie Hunt. So mice to meet you, Mab, and I’m very honored to be your hero. Pawsome. I’m glad you joined the series. I’m sure you’re doing a great job. Siamese cat characters are purrfect fits for cat cozies. 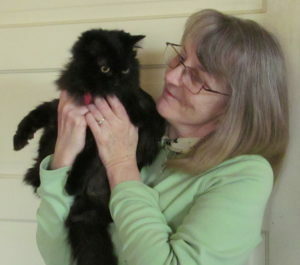 Mollie’s Crazy Cat Lady cozy mysteries feature Lynley Cannon, a sixty-something cat shelter volunteer who finds more trouble than a cat in catnip. Lynley lives in Portland, Oregon in an old Victorian house with her fluctuating number of cats. Right now our clowder is up to eight. Lynley is retired, and you wouldn’t think she could get herself into so many precarious situations, but it’s her natural, cat-like curiosity that makes her jump paws-first into extraordinary things. Sounds like you have your paws full with a human character like that. Some of my clan, like Dirty Harry, Little, and Big Red, are real cats who actually live with my author. Then there are Violet and Emilio who are fashioned after cats Mollie has fostered in the past. I, myself, am a fictional creation and proud of it! I’m fictional, too, although I’m slightly based on Debbie’s cat, Oliver, who has gone to Rainbow Bridge last year. “…“What will happen to the kitten?” I said impulsively. I held the small kit whom I had come to think of as Mab, the Faerie Queen from Celtic folklore. (Had she communicated that name to me or had I just made it up?) “Mab,” I said softly, stroking fur softer than silk. “Nothing,” I said, turning away from him before he could change his mind. Suddenly through the open window over the kennel, I heard the crunch of gravel. Garrison heard it too. Instantly he tensed, head turned to listen. “Are you expecting somebody?” I asked. “You wait here,” was all he said as he bounded up the stairs, two at a time. I heard his heavy footsteps cross the floor above; a car door slammed, then the babel of voices, loud but not loud enough for me to tell what was going on. I prayed that the visitor was someone who could get me out of that madhouse—a contingent of FBI agents with flack vests and automatic weapons would fit the bill nicely—but I had a feeling that I might not be so lucky. Someone stomped into the living room, and a sharp, metallic clatter hit the floor. The hubbub continued: voices raised in anger; a high pitched bawl; the trample of feet resonating throughout the old house. I’m sure you’re in for many more exciting adventures. I, like my fur-sisters and brothers, do not talk human. We do, however, have a great deal of telepathic ability. Trouble is, humans are often too dense to pick up on what we try to project to them. That’s when I, a Siamese, revert to form and make lots of yowly noise. We Siamese are certainly known for our vocal abilities. Don’t be afraid to influence the story. My author never knew I was going to turn out to be a magical cat until recently. Surprise!! 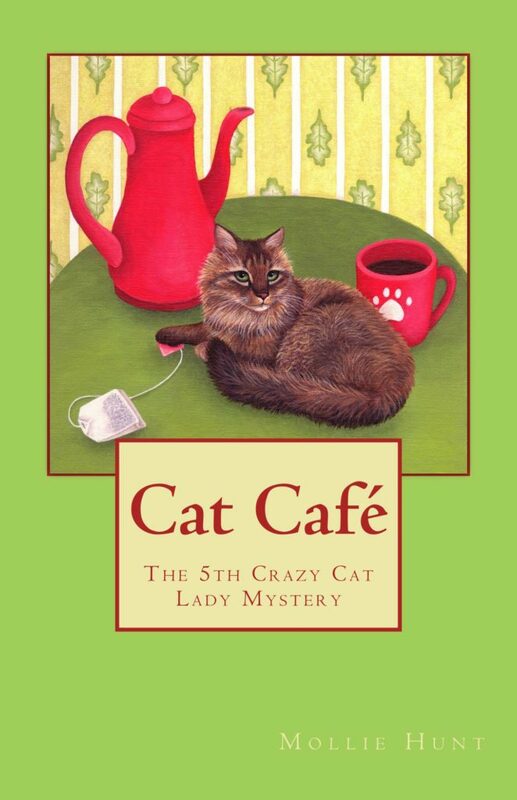 We just released Cat Café, Crazy Cat Lady cozy mystery #5 (A body is discovered on the floor of the cat café, and all the black cats are missing!) https://www.amazon.com/dp/B07HKQ4TKT last month, so it will be a little while before the following book comes out. The next in line is Cosmic Cat (When a superhero cosplayer falls to his death at a comic con, Lynley is left holding the bag— and a cat!) and a Christmas novella called Cat Noel (Lynley finds a new meaning of Christmas when a wiccan’s familiar is cat-napped before the winter solstice festival and Lynley becomes her only hope.) That brings us to Cat Conundrum (A locked room. A dead man. The cat is the only witness, and he isn’t talking.) which is what Mollie is writing right now. There is also talk of Mollie’s cat scifi-fantasy Cat Summer being published soon by Fire Star Press! Concatulations! Your author sure is busy. I know Debbie also has lots of ideas for our 5th Cobble Cove mystery adventure and is working on some other secret projects. I don’t have time for social media, being far too busy with cat stuff, such as playing, napping, eating, meditating… did I mention playing? But here are my author’s sites. I’m sure she’d purr if your readers stopped by! I totally understand. The only social media I’m on is this blog. Thanks for sharing your author’s links, and best whiskers to you and Mollie on your upcoming books. Thanks also for the purrfect interview. I’m sharing your blog tour info below along with your rafflecopter. Thank you for being part of the book tour for “Cat Cafe” by Mollie Hunt. Enjoyed reading the excerpt and hearing from Mab, such an adorable kitty. Can’t wait for the opportunity to read this great sounding book. 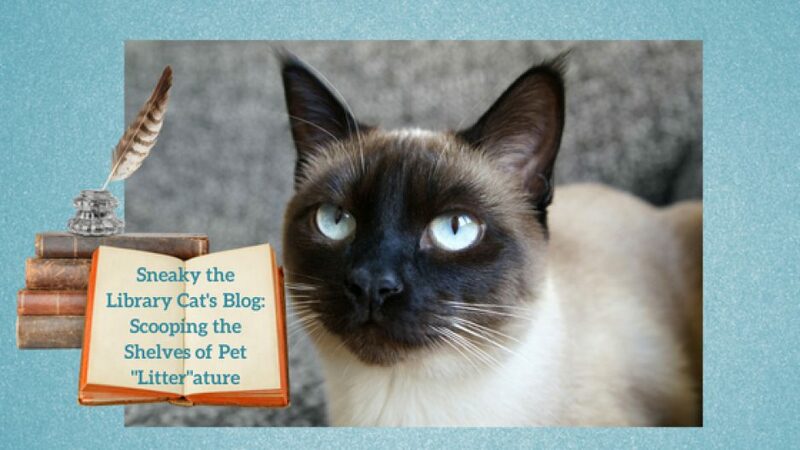 Thanks so much to Sneaky for hosting this stop on my “Cat Café” Great Escapes Virtual Book Tour! Mab had so much fun with the questions. Sneaky enjoyed cat chatting with Mab, too. Hope you had a pawsome book tour.